Even for a city the size of New York City, Hurricane Sandy was extraordinary. Over 375,000 New Yorkers were forced to evacuate, about 6,700 patients from 37 different healthcare facilities were relocated, and the city’s 911 system handled 20,000 calls per hour (more than on 9/11). Water rescue teams saved more than 2,200 people and conducted grid searches of 31,000 homes and businesses. Although NYC is very well prepared, Hurricane Sandy still forced officials and emergency managers to think outside the box. Before Sandy hit New York, Mayor Michael Bloomberg ordered an evacuation of flood-prone, low-lying areas (also known as Zone “A”). When officials wanted to understand how many residents had followed the evacuation order, the city turned to an unexpected source: the Department of Environmental Protection (DEP). In NYC, the DEP serves as the city’s water provider. In many areas, the DEP has installed automated meter readers or AMR. 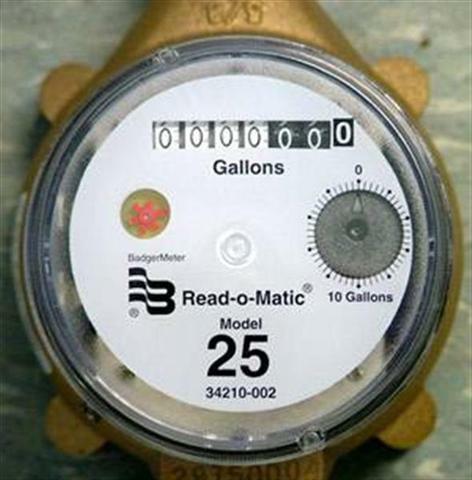 According to their website, “The AMR system consists of small, low-power radio transmitters connected to individual water meters that send daily readings to a network of rooftop receivers throughout the city.” Having an AMR means no longer having to estimate water bills and no long having a technician enter backyards to read the water meter. The system is also great for allowing residents to view and manage their water usage. Residents can even use the system to determine if they have an undetected water leak. Drastic changes in usage can be more easily recognized when shown on a graph via the web. It was not intended to be much help during an evacuation. water usage. If an AMR was detecting water usage, it usually meant a household had failed to heed to evacuation instructions. NYPD were not making arrests for disobeying the evacuation order, but it gave emergency managers better insight as to efficacy of their instructions and guidance to the citizens of New York City. After Sandy hit NYC, fuel supply was at an all-time low. The storm had closed ports and fuel terminals along the East Coast and many pumping stations were without electricity. Critical harbors and waterways could do nothing as Sandy displaced buoys and other critical navigation equipment. Debris littered roadways and significantly delayed fuel shipments. Local gas stations lacked backup generators and were also slow to resume/reconstitute operations. Finding fuel was extremely difficult throughout the northeast region. Citizens turned to the internet to find a solution. 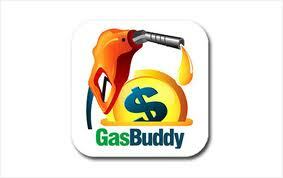 GasBuddy, a website and smartphone app, was designed to help users locate cheap gas. 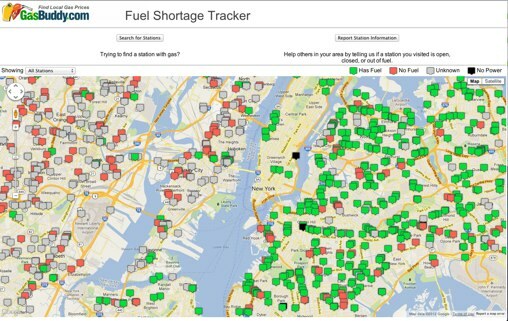 After Sandy, however, the owners of GasBuddy realized that 77% of New York City’s 800 gas stations were without fuel. Citizens were desperate for any fuel—not just the cheapest gas following the disaster. GasBuddy developers got to work and were able to come up with some quick modifications to the GasBuddy platform. Now, “gas spotters” could use GasBuddy to report which gas stations were open for business and had fuel. Although not designed to help during disasters, GasBuddy’s developers turned their website into a clearinghouse of actionable information. In many ways, GasBuddy became a poster child for effective crowdsourcing. Crowdsourcing is the idea that an unstructured crowd can create synergy if harnessed correctly. The GasBuddy system was successful because it quickly adapted to meet the needs of the community, was simple and easy to use, and was even self-correcting. People make mistakes and can even maliciously post misinformation. But crowdsourcing is efficient at identifying misinformation and blocking misusers. For example, if a gas station depleted its reserves and had to turn away customers, GasBuddy users could easily report that information and steer others away from closed gas stations. Once a gas station resupplied, spotters could tag the gas station as available. Anyone who routinely posts misinformation can be blocked from the service. Even though it was not designed for gas shortages following disasters, GasBuddy developers were able to efficiently crowdsource one of the biggest problems facing the region and provide a no-cost solution for thousands of survivors. In the US, Emergency Support Function (ESF) 6 includes planning and response for mass care and feeding programs. After Hurricane Sandy, the demand for hot meals cooked locally exceeded supply. While many of the typical providers are the National Guard and other volunteer organizations active in disasters (VOADs), residents in New York began receiving free hot meals from organizations with funny names. The Fisherman’s Dog, BigD’s Grub, Mudpeople, and Frites’N’Meats were just a few of the dozens of entities that mobilized after Sandy. While many restaurants were without electricity, hot water, or fresh linens, New York City’s food trucks entered devastated areas and got to work preparing thousands of meals. Many food trucks served meals at pay-what-you-can prices. 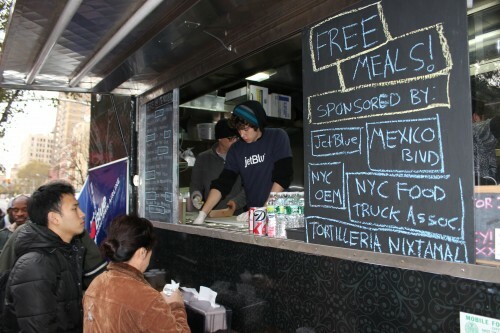 Other food trucks received financial backing from celebrities (such as Mike D from the Beastie Boys) offered free meals. The Mayor’s Fund paid for over 250,000 warm meals delivered via food truck. While food trucks in New York City have been controversial, the New York City Food Truck Association immediately mobilized to coordinate food trucks in underserved areas that needed meals the most. While disasters are often opportunities to become extremely resourceful, Hurricane Sandy provided an extreme example of the power of repurposing typical technologies, applications, and even food trucks into successful and atypical disaster relief service providers. While there is no substitute for careful planning and preparedness, empowering the community to participate in its own recovery can provide excellent results and, most importantly, save lives.